Amicus Productions was set up as a rival to Hammer Horror in the sixties. Many of its films took the form of creepy, and maybe even a bit knowingly silly, portmanteaux tales of insanity, revenge and grim death. 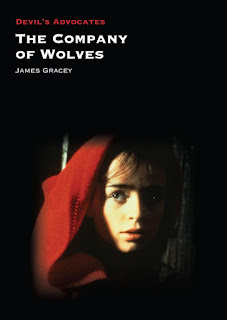 Some of their more well known titles include Torture Garden, Scream And Scream Again, I Monster and The House that Dripped Blood. The Skull is a pretty typical example of their output, an atmospheric, thoroughly ridiculous, but nonetheless entertaining slice of gothic schlock. 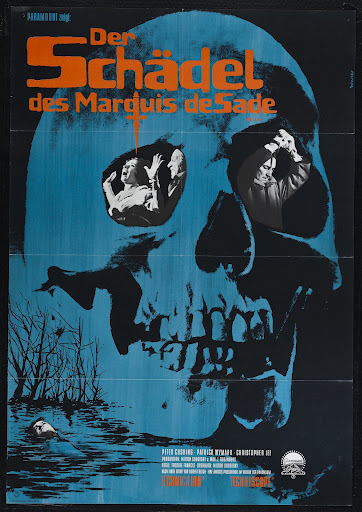 The story follows Peter Cushing as Dr maitland, a collector of odd and bizarre artefacts and transcripts, who goes a bit insane after acquiring the skull of the Marquis de Sade. What's not to love? Directed with notable flair by Freddie Francis and based on a short story by Robert Bloch, The Skull unfolds at a languid pace. Untypical attention to characterisation is lavished upon Cushing’s Dr Maitland as he sinks deeper into despair and insanity. Cushing is a credible actor and he holds his performance together well, as a subtle study in mental breakdown and obsession. 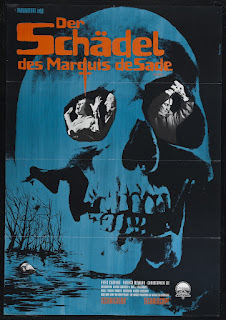 Opening with a moody, and rather rudimentary sequence, in which a phrenologist exhumes the coffin of the Marquis de Sade in order to extract his skull to study it, the rest of the film follows the journey of the skull as it brings death and insanity to all those who encounter it. It is soon revealed that the Marquis de Sade was possessed by an evil spirit who took up residence in his skull when he died. The spirit continues to practise dark masses and wield unfathomable power over all who coven it. Christopher Lee also pops up in an utterly thankless role. He buys some grotesque statues at an auction and claims to have been nearly driven insane when he too owned the skull of de Sade. Of course his warnings fall on deaf ears as Cushing continues to furrow his brow and attempt to procure the skull for his collection. 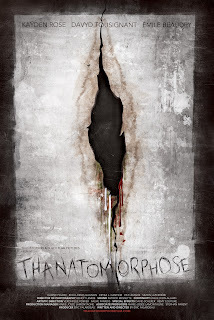 The film is peppered with bizarre and obscure point of view shots, particularly those from inside the skull itself. We as the audience are also privy to vantage points such as the view from inside a coffin, a room from behind the fireplace and the view from a cabinet after the glass has been shattered. There is a rather effective dream sequence (or is it?) where Cushing is harassed in his own home by two men who claim to be the police. 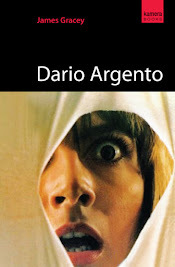 They bring him in rather hostile fashion to a deserted building where he is greeted by a crazed Judge who forces him to play a game of Russian roulette. He is then thrown into a room with poisonous gas billowing out of several air ducts. As if this wasn’t bad enough, events continue to grow more nightmarish and illogical as the walls of this room begin to close in. I’m guessing the last thing you’d do if you found yourself in a situation like this is to do what Cushing does: start waving your arms around, causing the gas to billow out even further into the room. This sequence is perhaps one of the most striking and provocative in the film. Maitland’s anxiety and helplessness are deeply unsettling and he seems to exist in a place where no one knows where he is, or even cares about him. The film really excels as we near the climax: Maitland is tormented in his own home by the ever restless skull as it breaks out of its glass cabinet and glides ominously around after him, forcing him to almost murder his sleeping wife. Maitland wanders mindlessly throughout his house, confronted by the grinning spectre at every turn. The image of the levitating skull, while quite silly, is still a striking one. A number of quite significant plot holes are left gaping as the film ends: what exactly was the significance of the statues Lee’s character simply HAD to have? Was that a dream sequence when Maitland was forced to play Russian roulette? Of course, in not providing satisfactory conclusions to these matters, it doesn’t hamper the enjoyment of watching The Skull, if anything it adds to the illogicality and nightmarish events. And in a film where the skull of the Marquis de Sade is possessed by an evil spirit and rips peoples’ throats out after driving them insane, you can’t really expect there to be an air of logic or rationale, can you?